Is there a better alternative to MacPips PictureThis? Is MacPips PictureThis really the best app in Puzzle category? Will MacPips PictureThis work good on macOS 10.13.4? MacPips PictureThis! 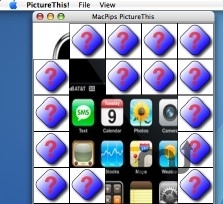 is a simple and addictive picture puzzle game for Mac OS X.
PictureThis! works by randomly selecting pictures from your iPhoto® library or other folder on your computer. The idea is to guess which picture you have by revealing as few squares as possible. You gain points for guessing pictures correctly, and lose them for each square that have to reveal or for wrong guesses. MacPips PictureThis needs a review. Be the first to review this app and get the discussion started! MacPips PictureThis needs a rating. Be the first to rate this app and get the discussion started!